What flap sizes are available? 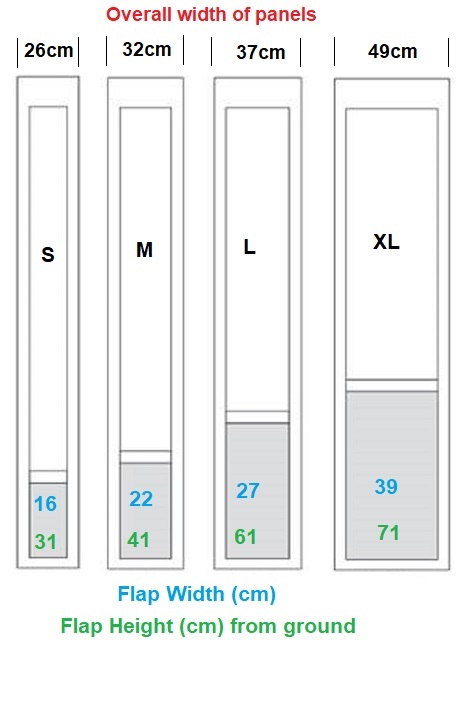 Our dog doors for sliding doors come in four flap sizes as outlined below in the picture and table. The bottom rail (rise) is only 5cm on ALL sizes so easy for pet access even when they are old! How do I select the flap size for my pet? Are you aware that many people overestimate the size of the flap they need? Please ensure you check the flap size against the shoulder height and width of your dog as weight is not a good guide due to all the different shapes and sizes of breeds. It is best if the shoulder height of your pet is a minimum of 1-2cm shorter than the top of the flap so that they can easily get through the flap without hitting their back. Please note cats tend to use the small flap unless they are bigger than average- in which case select a medium flap. DOGS! Most small-medium size dogs prefer the medium flap (same price as the small flap). Only order the small for tiny tiny breeds like Mini Dachs/Poodles or Chihuahuas. NOTE: The flap height is from the ground to the top of the flap. Please note the XL pet door is 49cm wide so please check your opening space to ensure you have enough room for human access before you order as returns get expensive due to all the courier and warehouse fees. Order NOW - Your freedom awaits!